WHY GO TO REYKJAVIK & THE GOLDEN CIRCLE? Reykjavik is the heart and capital of Iceland. This is the best place for checking out museums, catching up on shopping, heading out for rowdy nightlife, feasting on gourmet food and having your pick of places to sleep. Get a taste of Iceland’s crater lakes, waterfalls and geysers with a visit to the nearby Golden Circle. WHERE TO STAY IN REYKJAVIK & THE GOLDEN CIRCLE? Reykjavik is small and everything is within walking distance if you stay in the city center. It’s cheaper to stay outside the center but public transportation is limited and cabs are expensive. If you’re doing a day trip to the Golden Circle, make it easy on yourself and stay in Reykjavik. But if you want to venture outside the city for a night, we’ve listed a few Golden Circle options below. Silica Hotel ($$$$) If you love bathing in geothermal water and mud, spend a night or two relaxing inside the Blue Lagoon. Swim around the hotel’s private lagoon. Hotel 101 ($$$$) Chic, design hotel in city center. Lobby is filled art books and has a toasty fireplace. ION City Hotel ($$$) Stunning warehouse chic spot to sleep in center of city. Has a fitness center. 105 A Townhouse Hotel ($$$) Sleek and central, large rooms filled with retro decor. Reykjavik Downtown Hostel ($) Amazing value, relaxed and clean. A home away from home. ION Adventure Hotel ($$$$$) Located just outside of Thingvellir National Park, this contemporary hotel has stunning views of moss-covered fields and water. Iceland’s ultimate design hotel. Frost and Fire Hotel ($$$) Enjoy river views, bubbling geothermal springs, modern rooms, and an organic breakfast. Just off the Ring Road on your way to the Golden Circle. WHERE TO EAT IN REYKJAVIK & THE GOLDEN CIRCLE? If you want to make sure you have a table somewhere, make reservations, especially if it’s the summer or a weekend. 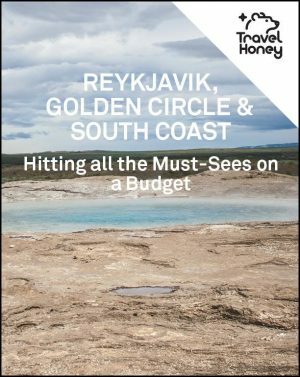 See the interactive map that comes with every Travel Honey Reykjavik itinerary for locations of the eateries below. Dill ($$$$$) A foodie experience. Dishes are complex, unique combinations of locally sourced ingredients. Make a reservation a couple months ahead of time. Saegreifinn ($$) Famous for seafood shish kabobs and fish stew (they have veggie kabobs too!). The Laundromat Cafe ($$) If you want something fun and easy. Great brunch. Also serve serve dinner and have a huge beer selection. Baejarins Beztu Pylsur ($) A visit from Bill Clinton made this hot dog stand famous. The dogs come with raw and fried onion, mustard, ketchup and remolaude sauce. Brand & Co. Bakery ($) A super tasty bakery with a window into the back so you can watch baker at his craft. Fridheimar ($$$) Eat a tasty gourmet lunch at a working family-run tomato greenhouse in Selfoss. WHERE TO GO AT NIGHT IN REYKJAVIK? If you want to go out, Reykjavik’s your scene. Like a lot of European cities, the bars don’t get going until after midnight. Bar Ananas ($$$) Tropical tiki bar with artsy, fun cocktails. Petersen ($$$) Rooftop drinks with great outdoor seating. Mikkeller & Friends ($$) Offers twenty different beers on tap plus a wide selection of organic wines and spirits. Interior designed by famous Icelandic designer. Tivoli ($$) Reasonable drinks for Iceland, around $10 a cocktail. Kaffibarinn ($$) One of Reykjavik’s iconic bars, known for its cozy, boho atmosphere, hip DJs, late nights and a generous selection of beers. Lebowski Bar ($$) As the name implies, this is a bar dedicated to the Big Lebowski. Touristy, but if you like the Big Lebowski, go and order white Russian. Kex Hostel Bar ($$) Cool and funky hostel bar. Always a scene and great spot to meet other travelers. BEST INSTAGRAM ACCOUNTS FOR REYKJAVIK? There are many direct flights from the U.S. and you can often make a stopover to Europe for a few days at no extra cost. Public transport from the airport into the city center is easy. It’s usually cheaper if you can book transport through your hotel or Airbnb. Or hop on the Fly Bus, which leaves every 30 minutes from the airport and costs $27 one way. The bus will drop you off at one of several points close to your hotel downtown. If you’re renting a car, it’s an easy 50 minute drive mostly on one road. HOW TO GET AROUND REYKJAVIK AND THE GOLDEN CIRCLE? The city center is small so everything is within walking distance. There are no Ubers and taxis are expensive. Renting a car or taking a tour is your best bet for the Golden Circle. BEST ITINERARIES FOR REYKJAVIK AND THE GOLDEN CIRCLE? Check out these awesome itineraries from Travel Honey’s savvy traveler contributors. Don’t see an itinerary that matches your travel needs? Let us know by emailing support@travelhoney.com.